As summer turns to Fall in the Arctic, the ice cover will shrink to its smallest extent for the year. This day is an important day because the measurement taken will be used to analyze the state of the Arctic region and add to the growing body of knowledge of the fundamental changes that are taking place. After a record setting low in 2012, the 2013 summer sea ice extent rebounded – but only slightly. At 5.10 million square kilometers or 1.97 million square miles, 2013 comes in 6th place for the smallest summer sea ice minimum extent in recorded history. This chart shows the disturbing trend over the last thirty years. The sea ice extent at the end of the melt season is on a decline. 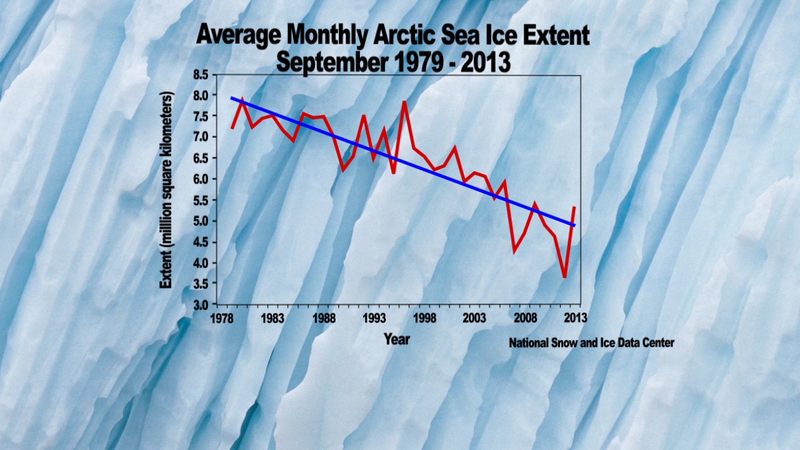 And not only is the ice extent getting smaller, but the ice is also thinning at an alarming rate. In fact, some computer models project we are on track to see an ice-free summer within 20 years. That’s 40 to 50 years earlier than previously forecasted. The more the ice melts, the more ocean surface is exposed that can absorb heat from the sun. This warms the water and the region even further, melting even more ice. This scenario has direct consequences: A warmer Arctic accelerates the melting of Greenland’s ice sheet. This ice sheet is currently 1.9 miles thick and, if melted, contains enough ice to raise global sea levels by about 25 feet. Less sea ice and warmer ocean water also affect atmospheric patterns, like the jet stream, and may lead to more extreme summer and winter weather events in the U.S., Europe, and Asia. So, what happens in the Arctic doesn’t stay in the Arctic. The disappearance of summer sea ice cover is one of the most visible warning signs of severe climate change and will have consequences that are felt all over the world. Arctic sea ice reached its maximum extent for the year on March 21 at 14.91 million square kilometers (5.76 million square miles), making it the fifth lowest maximum in the satellite record. The NASA IceBridge mission combines multiple instruments to map ice surface topography, bedrock topography beneath the ice sheets, grounding line position, ice and snow thickness, and sea ice distribution and freeboard.